I am so mad that I just have to get this off of my chest!!! 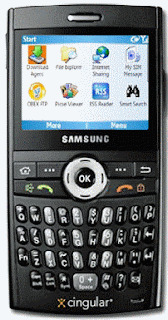 I purchased a Samsung Blackjack phone in December and was offered a "PDA" data plan by the Cingular salesperson for $39.99 a month. Now that I have done some investigation of my own and talked to other Blackjack owners, I found out I could instead be on the "MediaMax 200" Smartphone plan for only $19.99 a month which does EXACTLY* the same thing as the $39.99 plan PLUS it gives me 200 free text messages. Everyone calls the Blackjack a Smartphone except for Cingular who wants owners to pay $20 extra per month. They figure only business people would buy the Blackjack so let's just gouge them. Over the weekend, I called Cingular customer service to change my plan to the "MediaMax 200" Smartphone plan. Today I read that Cingular is cracking down on this migration. I hurriedly called Cingular to change my husband's PDA plan to the MediaMax 200 plan. At first, I was connected to the Cingular Business customer service and he refused to change the plan and said his system would not allow him to do so. I hung up on him and called back to make sure I was not connected to Cingular Business and I was able to change it without any problems. Unfortunately, I heard Cingular is going through their system and forcing all their Blackjack owners into the PDA plan. This sounds illegal to me and think a class action lawsuit might just be on the horizon. A smartphone uses Microsoft Mobile software and is a phone with PDA capabilities. A PDA uses PocketPC technology and is essentially a PDA with phone capabilities which uses a touchscreen or stylus. The Blackjack does not have touchscreen nor stylus capabilities. The Blackjack uses the Microsoft Mobile software and even Microsoft calls this device a smartphone! *One difference that I'm aware of is the PDA plan allows a laptop to connect to the Blackjack as a modem. For six months I used thier LG CU500 as a high speed tethered modem with a USB cable using the $30 a month Unlimited Data Access plan for 3G phones. Last week they shut off my phone until I changed my plan to the $60 a month data access for the remainder of my contract. I hate cingular. The Connection Manager software they provide specifically offers and supports the feature!!!!!!!!!!! !